BeeDazzle Revitalize delivers quality rejuvenation without fuss or downtime by uniting refinement and recovery in one unique formulation. Sensitive-friendly AHAs (mandelic and lactic) recondition skin’s texture and complexion while bioactive Manuka Honey nurtures healing with anti-inflammatory, antimicrobial and conditioning effects. MANDELIC ACID ( L): A natural AHA, Mandelic Acid assists cell turnover. It is gentle yet effective in treating a wide range of skin conditions with antibacterial and anti-inflammatory effects. LACTIC ACID (L) : Another natural AHA, Lactic Acid reduces wrinkles, improves tone, and has humectant properties all in one. MANUKA HONEY: With optimal antibacterial activity, Manuka Honey enhances immune activity. It also works as an anti-inflammatory antioxidant and humectant with protective effects. MIRABILIS JALAPA EXTRACT: This soothing extract calms reactive skin and improves skin’s long-term resilience against sensitivity triggers. It also supports skin’s barrier function and improves hydration. CAUTION: Do not use on clients who have allergies to Almonds, Milk, or Honey. Do not use on broken/cracked skin, sun-burned skin or cystic acne. Please check a Physicians Desk reference to make sure no issues with medications and ingredients. For external use only. Avoid contact with eyes. Keep out of reach of children. Product contains Alpha Hydroxy Acids (AHA). Use SPF for 2 weeks daily following application of this product. I have had the BeeDazzle Mask used on me several time’s now and I have to say it is quickly becoming my favorite mask. My skin feels tighter and brighter every time it is used. I don’t get the dry feeling like I usually do with peels but get all the benefits. If you haven’t done the BeeDazzled yet, you should. The BeeDazzle Mask is the perfect addition in the treatment room. I love using it before a diamond tip microderm for clients that need a boost in exfoliation. This mask is super easy to apply and gives great results in a single treatment or series with no down time for the client. My skin felt amazing right after my treatment with BeeDazzle Mask and has continued to feel that way since its treatment. My skin felt plumped and healthy. As a person with oily skin, my pores have always been an issue for me. The treatment dramatically reduced the appearance of my pores. I would definitely have the Beedazzle Mask treatment again. 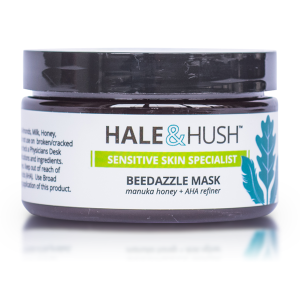 I have been using the BeeDazzle Mask for several months now with great results. All my clients have noticed skin lightening, reduced wrinkles as well as reduced pore size. I have noticed much greater hydration in addition to the above. I am seeing the greatest difference in Fitz 3, 4 and 5. I love that I can use it with no down time as the in between peel for my tougher acne customers. Back treatments are really easy and I am finding the scaring is reducing quickly.